We are soccer enthusiasts who organize Intown Atlanta pickup soccer games open to players of all skill levels in the community! Join our OpenSports group to view upcoming pickup sessions. 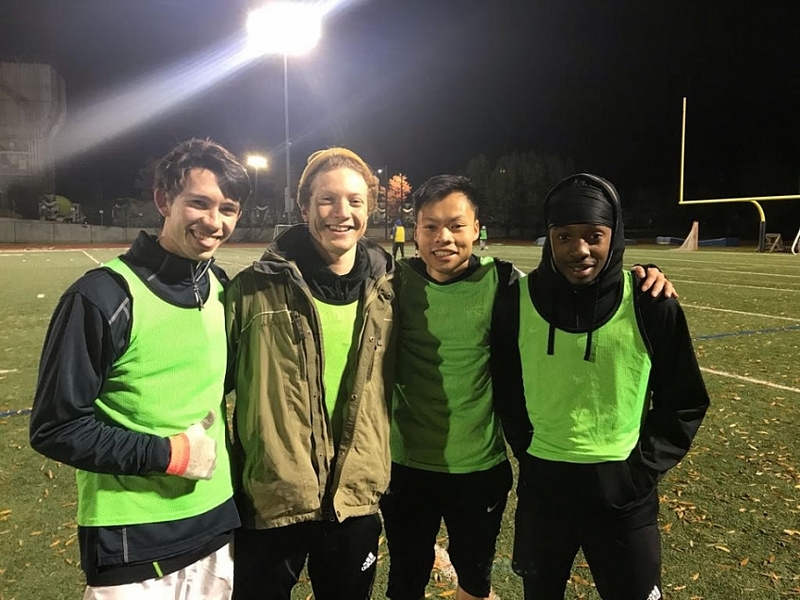 We reserve turf fields specifically for pickup soccer, provide clean pinnies to distinguish teams, and have organizers on hand to keep things fun and friendly for both competitive and novice players. All we ask from you is a positive attitude and small fee per session to cover the costs of fields, lights, organizers, and laundry. 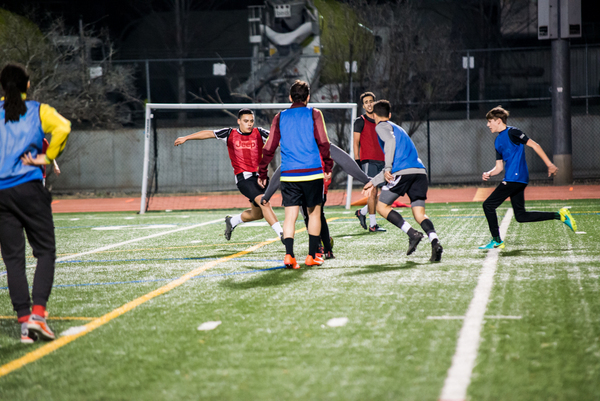 Our pickup soccer sessions often involve up to three simultaneous games up to 8v8, so it's important to RSVP for every pickup event on our OpenSports group here. 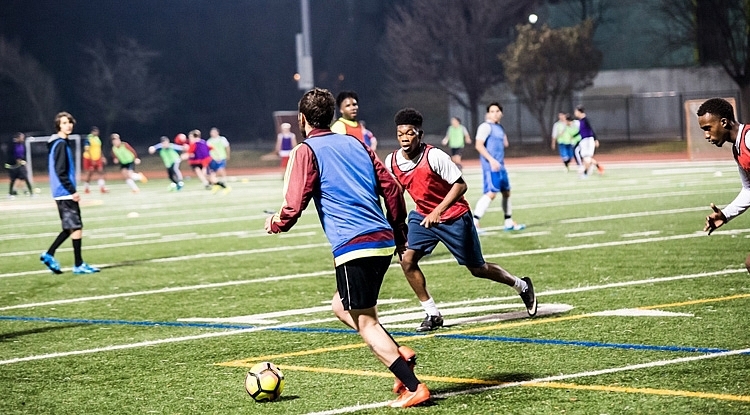 Browse all of our upcoming soccer events on our OpenSports group, including opportunities to play in our league games, beginner practices, and tournaments. We're excited to use an incredible pickup sports platform called OpenSports to manage our pickups. Then download the app to view and join our upcoming pickup events. And a lot more features! Thanks to everyone who came out to Maynard Jackson HS in April 2018 to meet and play with OpenSports co-founders James and Alicia, who came to Atlanta to meet with SOPFC (their largest group partner) and get player feedback to continue building great features. Join our OpenSports group for actual dates, times, and locations of upcoming pickups! Below is only a general guide to our pickups; we typically offer most of these sessions every week, but we frequently offer additional pickups or short notice games as well. Most pickup sessions REQUIRE you to join the event. If you show up without joining the event and claiming a spot, we may not have a room for you to play. Pickup soccer games at Maynard Jackson High School (East Atlanta) on turf with lights. 24-48 spots. Pickup soccer games and Beginner's Practice sessions at Washington High School (Westside) on turf with lights. 24-48 spots. Open for private pickups and training only currently. "Family Pickup Soccer" games at Maynard Jackson High School (East Atlanta) on turf. This involves kids and adults alike. Free! Pickup soccer games at Washington High School (Westside) on turf. 24-48 spots. 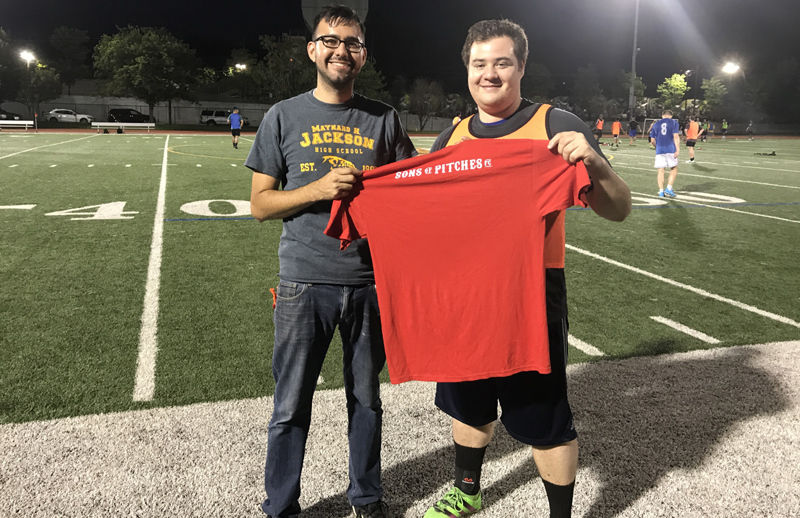 Our pickup soccer games are a great way to get to know our club better. Whether you're a pro, or someone who hasn't touched the ball in decades, we welcome you to participate. The rules below are a way of ensuring our pickup games stay fun and friendly for everyone. The first rule of Sons of Pitches FC is, YOU TALK ABOUT SONS OF PITCHES FC: Tell a friend to join our OpenSports group and play too! No running or warming up on the track. Call your own fouls, and no one else's. No proxy wars. That's how world wars start. If someone calls a foul, you must respect the call. Kick-in from the sides instead of throw-ins. Last player back (or a designated keeper) may use their hands in front of the goal, if the goal is at least 6' x 12' size. Games typically start by kicking the ball in the air and allowing it to bounce twice before being touched. Each pitch has a 6' x 12' goal, although limited RSVP games may use smaller goals. The full length of the field is divided into 3 equal pitches at maximum capacity. Limited RSVP sessions usually consist of one pitch and three teams, with one team rotating off every 10 minutes. Pickup sessions that rotate teams will only rotate up to three teams max per pitch. One team will rotate off every 10 minutes, so players will play 20 minutes at a time, then wait 10 minutes, etc. Players who have attended over 100 of our pickup sessions!